JUSTICE MINISTER ALAN Shatter and the Bar Council remain at odds over proposed reforms to the Irish legal system, which barristers claim will increase costs for the general public. Shatter yesterday accused the Bar Council of mounting a “misguided and misleading campaign against legal sector reform”. A statement released by his department said that the council, which represents all Irish barristers, was set against “any form of independent regulation of its own members”. The minister’s criticisms came after the Bar Council released a report which it says shows that proposed regulatory changes would lead to millions in extra costs which would “inevitably” be passed on to consumers. The legal profession is currently self-regulating. Proposed reforms would introduce a full independent regulatory body to oversee barristers and solicitors. However, legal figures have argued that this is too expensive, and suggested the body could be open to ministerial interference. “The Bar Council remains fully open to the reform of our profession to benefit consumers of legal services and practitioners alike,” council chairman Paul O’Higgins said yesterday. He acknowledged a “need for independent regulation”. According to the council, its assessment shows that the proposed Legal Services Regulatory Authority would cost between €5.3million and €8.6million a year more to operate than the current system, with another €5-7million required in setup costs. “The entire purpose of the Bill to reduce costs for the general public will have been defeated” by these proposals, O’Higgins said. The council has argued that self-regulation with independent oversight would be a better solution. However, Minister Shatter strongly criticised the Bar Council’s position. “The Bar Council continues to advocate the preservation of its exclusive reserve through the continuation of regulation of itself by itself,” his department’s statement said. It is impossible to reconcile the stance of the Bar Council which criticises the independence of the proposed new regulatory architecture whilst advocating continued self-regulation under its own supervision. Shatter said self-regulation of the profession was already a considerable expense for lawyers, adding that he was open to amendments to the Legal Services Bill to ensure that there was no possibility of the authority being seen as “anything other than independent”. 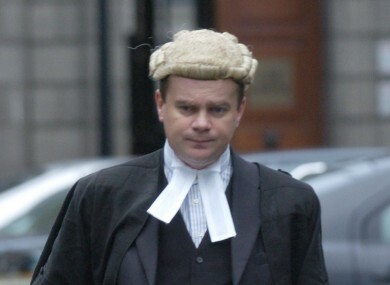 Email “Shatter at loggerheads with barristers over legal reforms”. Feedback on “Shatter at loggerheads with barristers over legal reforms”.